Children Identify Their Own Behavior and Bring Themselves Into Accountability. It is Fun and Positive. You Reward Their Correct Thinking With Stickers For Their Achievement Chart. 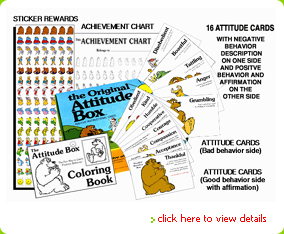 Go through the box with the child and explain each attitude and reward with a sticker. Allow the child to color the coloring book. Place The Attitude Box and achievement charts in a pleasant atmosphere for daily use. When negative attitudes or behavior arises, ask the child to go to The Attitude Box and find the card describing that attitude. Example: disobedient, unkind, impatient, impolite, boastful, tattling, untruthful, anger, selfish, careless, disrespectful, grumbling, perfection, fear, low self-esteem. This builds accountability as the child identifies their own actions. A younger child will need your assistance. The Attitude Characters aid in recognition. Have the child read the reverse side of the card describing the correct behavior. Example: obedient, kind, patient, polite, humble, cooperative, honesty, compassion, sharing, responsible, respectful, thankful, acceptance, courage, self worth. This reminds them of the correct behavior. The child should say the positive self-esteem " I" statement (it’s in red). Example: " I am obedient, I am kind, I am patient, I am polite, I am humble, I am cooperative, I am truthful, I am compassionate, I am thoughtful, I am responsible, I am respectful, I am thankful, I am courageous, I am OK."
Reward the child immediately with a corresponding sticker for their achievement chart (do not wait for changed behavior). This builds self-esteem by rewarding correct thinking. Now look for positive attitudes at all times and continue to encourage and reinforce with stickers and verbal praise. Be consistent and the Attitude Box will do the work for you.